Hannah Genders visits a newly-restored garden in Stratford. I had read in one of the landscape journals that The New Place in Stratford was having a makeover, so I decided to get on my bike and have a look, as it’s so close to our area. New Place is right in the middle of Stratford, near the town centre and just off Chapel Street. It’s where Shakespeare’s house originally stood, and although the house no longer exists, the gardens have been there for a long time. Last year, as part of the 400th anniversary of Shakespeare’s death, they had been revamped and opened to the public. I’d never been to the gardens before, but had seen photos and peeped over the hedge and found them rather uninspiring, which is not how I would describe the gardens now. The entrance is a large gateway on the original threshold of Shakespeare’s house, beautifully constructed in oak and bronze. This leads you into the first section of the garden, which has been called the “golden garden” – it’s a theatrical layout of brightly-coloured flags depicting Shakespeare’s plays. There are also rings of inlaid bronze in the paving under your feet, spanning out from the centre, and these were installed to show the ripple effect of his genius and how it has touched so many people. The paving is also softened with herbs and low-growing alpines. The perennials in the borders here echo the colours in the flags; alliums in May followed by Helenium in the summer and numerous grasses. The next section, which is called “The heart of the home”, is a circular area surrounded by pleached hornbeams – this is like a hedge on stilts and it gives a framework to the most amazing tree sculpture. In fact I thought it was a real tree, but it’s made of bronze and it leans dramatically away from Shakespeare’s writing desk and chair, again depicting the force of his talent. The tree is based on a hawthorn and incredibly life-like. This main area is full of drama, with curved seating allowing visitors to look out from what would have been the main living area in the house, to The Guild Chapel which would certainly have been there in Shakespeare’s day. The path then narrows slightly and to the left you discover the knot garden. This has been completely renovated following the original design by Ernest Law from 100 years ago, although the low hedges had the disease “box blight” so needed replacing – the plant they have used is a Japanese Euonymous called “The Rocket” and I hadn’t immediately noticed it wasn’t box, so it’s a good match. The centre of the knot garden has “WS” in a bronze circle, which was the seal of William Shakespeare. The planting is tightly packed in but generally soft colours of purple, blue and silver. 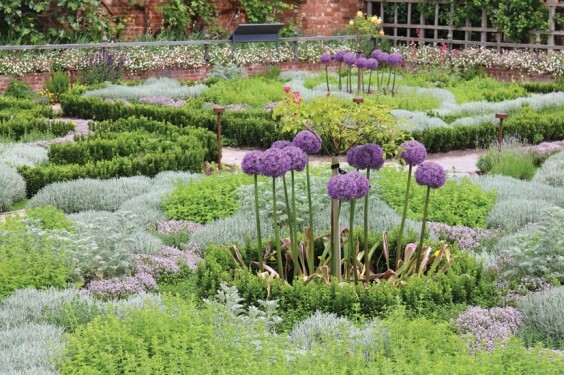 The alliums were looking particularly good on my first visit – I say my “first” visit, as I was so impressed the first time that I cycled back a few weeks later to meet the head gardener and interview him to gain further insight into the garden and its history. The head gardener (and he oversees all five Shakespeare Trust sites) is a guy called Glyn Jones, who has only been at the gardens for a year and previously was head gardener at Hidcote for 17 years while all the works to transform that garden were completed. One of the things I really appreciated was his comment on the fact that these gardens are not a museum and they need to move forward and develop. I asked Glyn what type of soil he was working with and he told me it was all imported because before the gardens were redone, the whole site had been an archaeological dig, which I guess is understandable given its significance. Along one side of the knot garden is a new, curved oak arbour. The original apple trees are still in place and the arbour has been constructed underneath to support them. It is a beautiful piece of workmanship and the paths are wide enough now to accommodate wheelchairs throughout the garden. You come out of the arbour and go along the perennial borders framed and backed by a massive, topiary yew hedge. The perennials here are cottage garden plantings, delphiniums and yarrow, followed by tall spikes of Echinops, soft but exuberant, with clipped shapes of golden yew to contain the borders at the front – and then your eye is drawn beyond the garden to the roof of the playhouse in the distance. It is all rather magical. The final part of the garden, which in total covers about two and a half acres, is a lawn area with three amazing mulberry trees in it. One of them is said to be the oldest and largest in the country, reputed to have been grown from a cutting taken from the original planted by Shakespeare in the garden. Whether this is true or not, the tree is very grand, even with all its props to hold the old branches up. On the days I visited, numerous people were enjoying this part of the garden, sitting having a coffee or a picnic, and I understand if you have a Stratford postcode you can enjoy the gardens for free at any time.